If you are a car or motorbike enthusiast, especially of a particular make or model, there's nothing more fulfilling than owning that vehicle of your dreams. Alas, things don't always work out the way we want, or otherwise I'd be owning a Ferrari 458 Italia or a Yamaha R1. 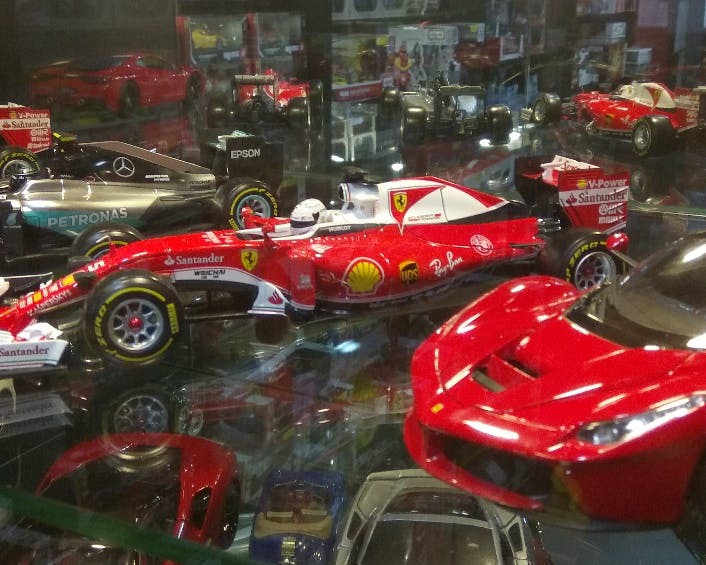 But thankfully, for me and wishful souls like me, there's Modelart, where die-cast cars and vehicles of every make, model, and brand are available at this collector's haven situated in Forum Mall, Koramangala. The best names in die-cast models, AutoArt, Maisto, and Bburago, are available here and you could start your collection or add to your collection. Ferraris, Corvettes, Mustangs, Lambos, and Porches all come in sizes as small as 1:43 to as big as 1:12. I just recently bought a 1:24 scale model of a Bburago Ferrari FXX and it cost me just INR 350. They keep adding new toys to their collection, so a monthly visit to this place is advisable. They also have a huge collection of radio-controlled models with some of them fuel-powered rather than the conventional battery-powered trinkets you get at Sapphire Toys. These guys, apart from selling these RC models, also do repairs and customisations.